The new website The Contemps has been getting lots of blogger press in the last few weeks. I finally checked it out and was really impressed with the selections of contemporary realistic YA fiction. Some schools have honor codes. Others have handbooks. 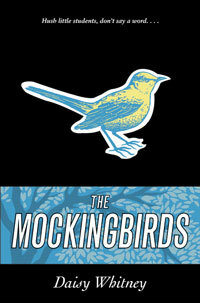 Themis Academy has the Mockingbirds. Themis Academy is a quiet boarding school with an exceptional student body that the administration trusts to always behave the honorable way--the Themis Way. So when Alex is date raped during her junior year, she has two options: stay silent and hope someone helps her, or enlist the Mockingbirds--a secret society of students dedicated to righting the wrongs of their fellow peers. In this honest, page-turning account of a teen girl's struggle to stand up for herself, debut author Daisy Whitney reminds readers that if you love something or someone--especially yourself--you fight for it. Thanks for dropping by! As far as I can tell, it looks like Deadly is purely historical - there's a more detailed description at the author's website here: http://www.juliechibbaro.com/disc.htm. The Mockingbirds sounds really dark and edgy - I've heard it's quite graphic, so I may check out some more reviews of it before I go ahead and pick it up. It does sound intense though! Away over to visit The Contemps now, thanks for the link.